Spectacular Beachfront Condo w/Panoramic Views of the Bay! Living room with slider. New furniture on its way. Dining area with bay window. New furniture on its way. Master bedroom. New king bed and dressers on the way. Second bedroom. New queen bed and dressers on the way. Condo as seen from the beach. Unit is upper left. Master bedroom with a king bed and slider to the deck and a second bedroom with a queen and twin bunk beds. Amenities include a fully equipped kitchen, central heating, washer/dryer, wireless internet access, 43'' flat screen smart TV and two 32'' flat screen TVs, 2 assigned parking spaces, and much more. As of 2019 all the furniture (with the exception of the bunk beds) is new. 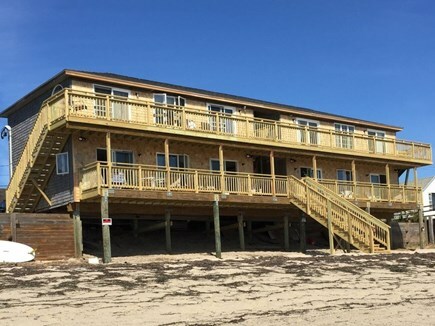 The condo is located on Beach Point in North Truro. It is a short ride away from beautiful ocean beaches, Provincetown, and many other attractions. You can swim in the protected waters of the Bay, take a whale watch cruise, attend a wine tasting at the Truro Vineyards, or play a round of golf on Truro’s fabulous Highland Links Course. Enjoy incredible shopping, local eateries, and vibrant nightlife in Provincetown, take a ride through the dunes, or bicycle on many of the trails that are part of the National Seashore. You can relax at your private beach or take in the sights. Additional pricing info: Cleaning fee $150, State and local taxes of 12.45% will apply. Both my wife and I fell in love with the cape as children and have finally been able to own a piece of it. We have rented many places over the years but this was our favorite. We are in the process of updating the interior (which will continue in the fall) to make it a home that we love; we look forward to sharing it with you. 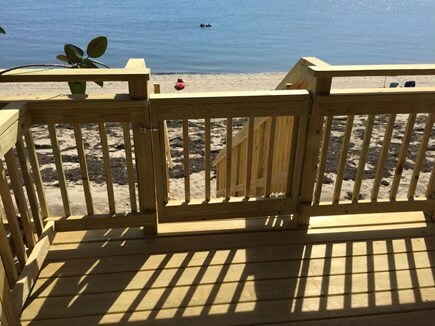 During the process of purchasing the condo, various people we interacted with, when learning the location, exclaimed that it has to be one of the best locations on the cape. The views from the deck are breathtaking. At night Provincetown is lit up and, if it is cloudless, you may even see the milky way in the night sky. The condo is one of the largest 2 bedrooms available with lots of glass to let that sunshine in (did I tell you it never rains in Truro?). Some parts of the cape are get really crowded in the summer. Not so in Truro. Approximately 2/3 of the land area of Truro comprises the National Seashore with its dunes that stretch to the ocean. If you want dining, shopping, bars or entertainment, however, Provincetown is only 2 miles away with convenient bus service that goes right past the condo every 30 minutes and only costs $2.